03:27 sofar what kind of service? 03:31 sofar not following, what status would you need on github releases? 03:32 sofar some sort of tag? 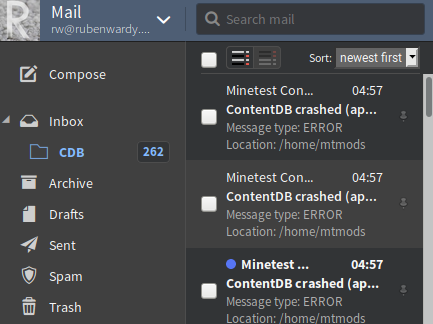 15:44 nerzhul rubenwardy, why cdb is crashing ? 15:44 nerzhul can you remind me what is celery ? 15:45 nerzhul is this a f*****g orm ? 15:45 nerzhul why don't use use a simple python workgroup with a queue directly ? 15:46 nerzhul and why do you have a work queue for a such case ? 17:00 rubenwardy and said "Minetest should really have a 'please type again' field when entering a password for a server." 17:01 Shara "first time ever"
17:01 * Shara wonders if they have it on purpose just due to recent things. 17:02 Fixer we don't have "please type again" field? 17:24 ircSparky <ANAND> ircSparky: Have you published the code of your guns mod? Where can I find it? 22:14 nerzhul how many bandwidth do you have ? 22:15 nerzhul do you know that ec2 instances are limited in terms of bandwith and you pay for bandwith outside of AWS ? 22:15 nerzhul not only for servers ?